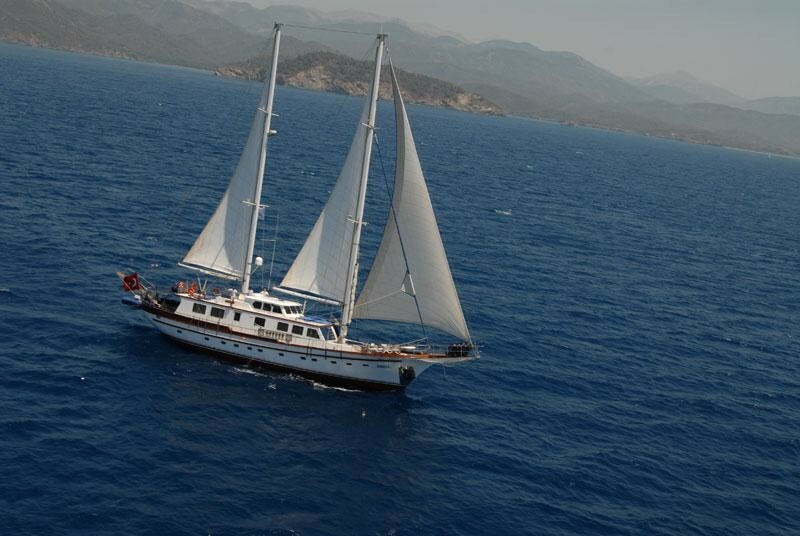 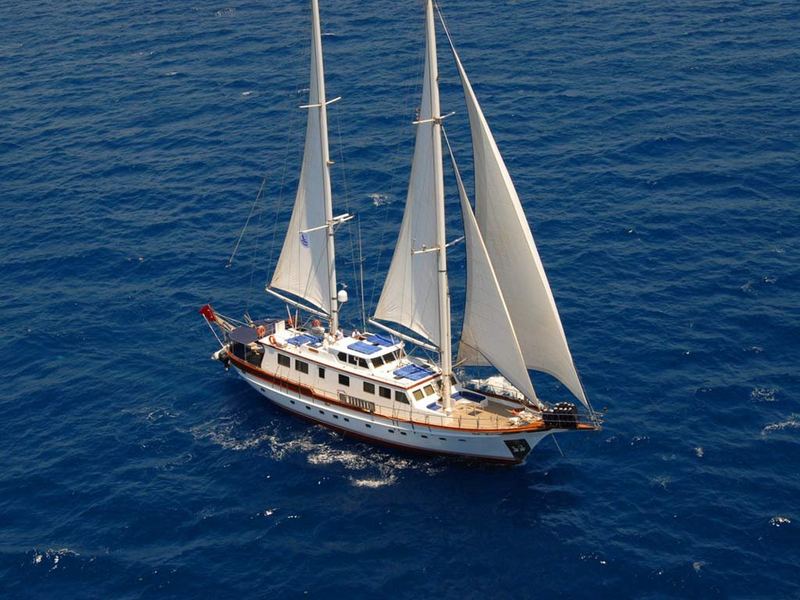 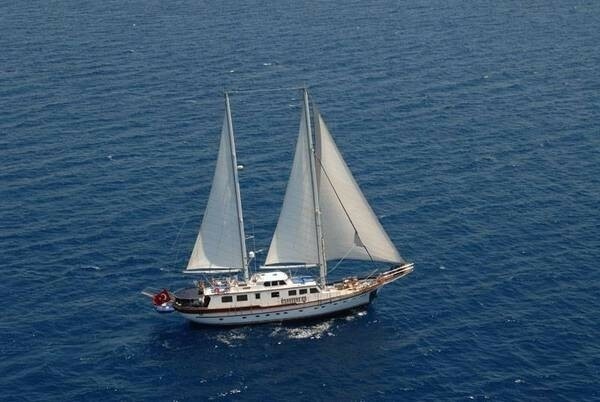 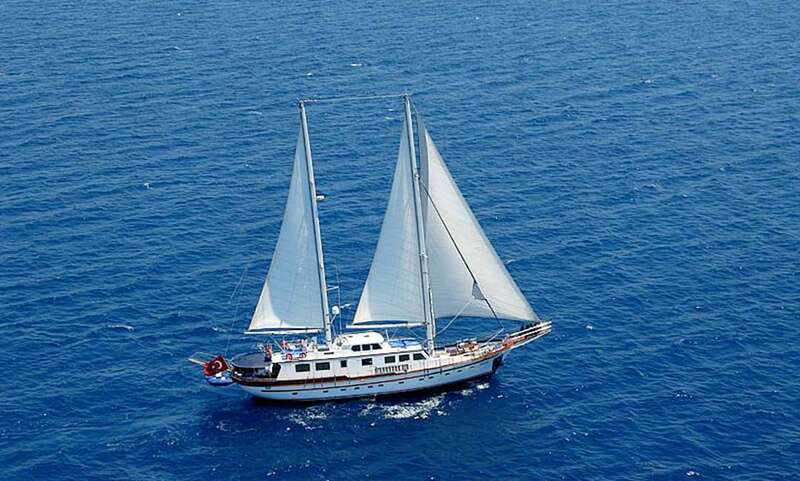 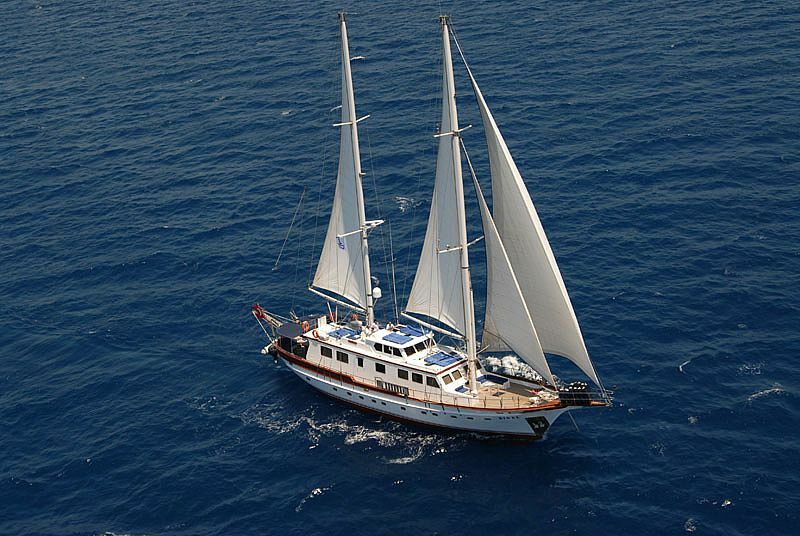 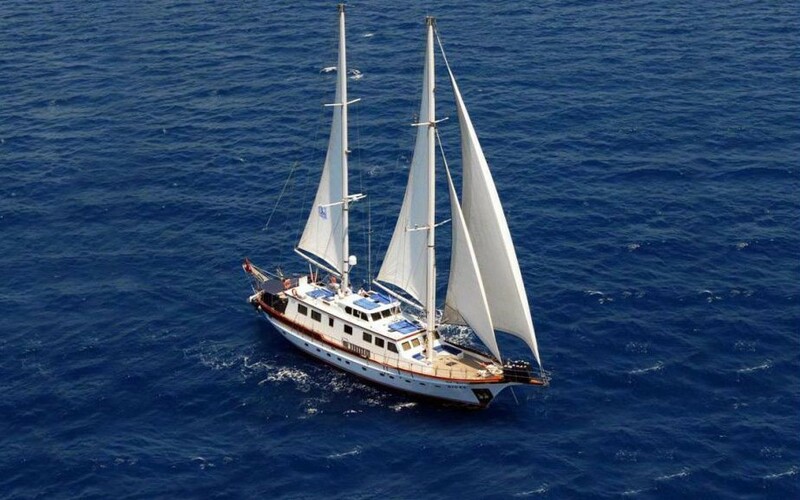 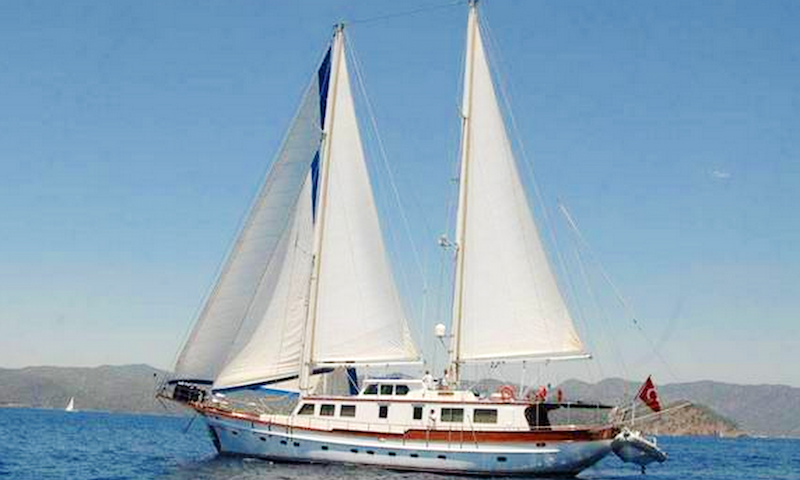 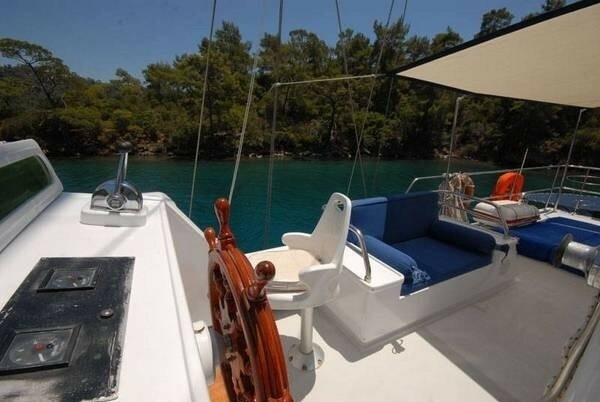 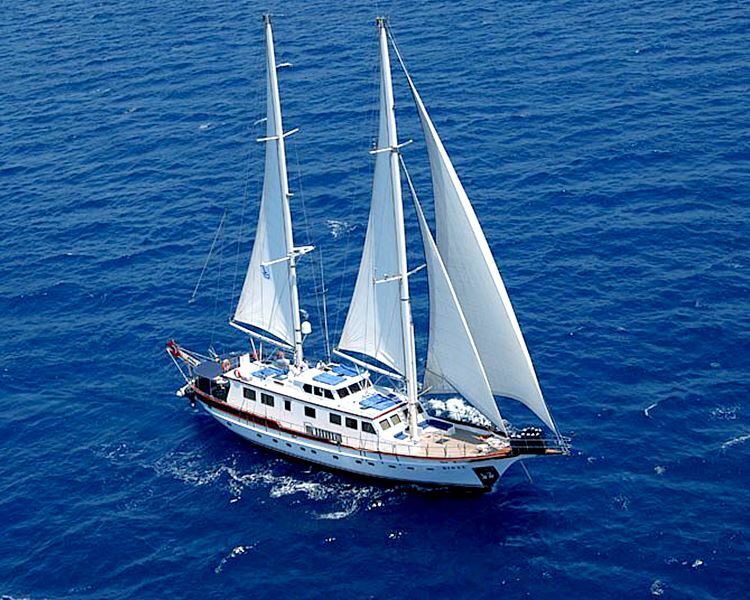 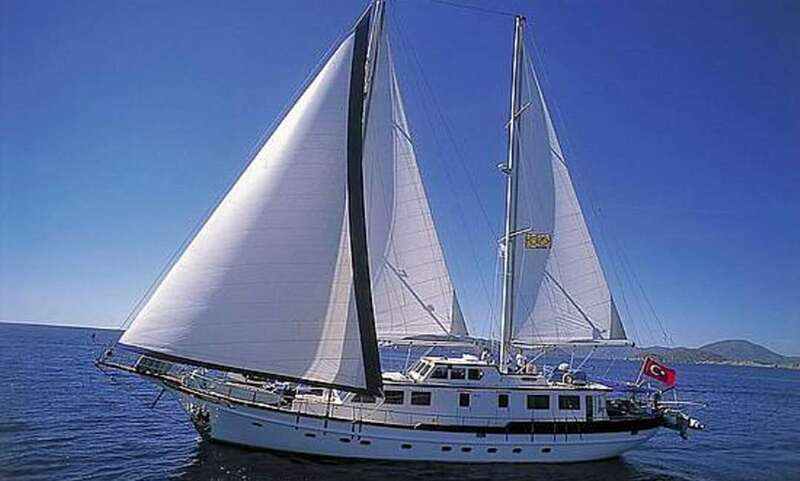 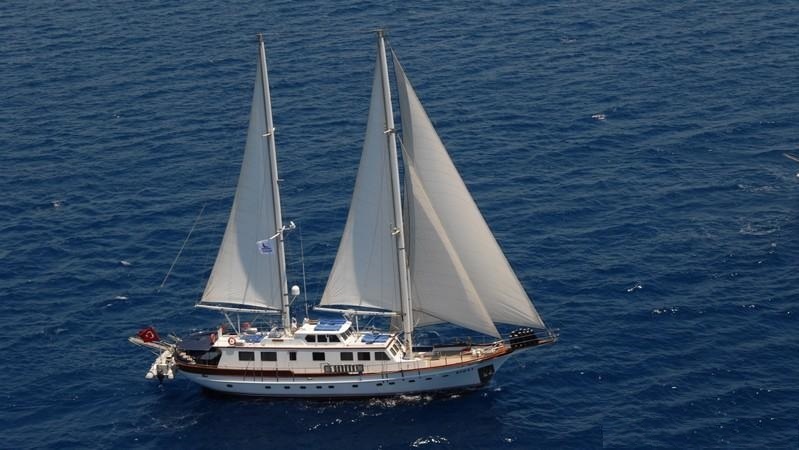 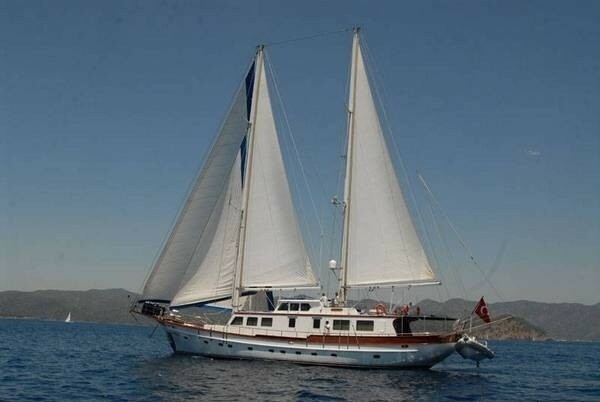 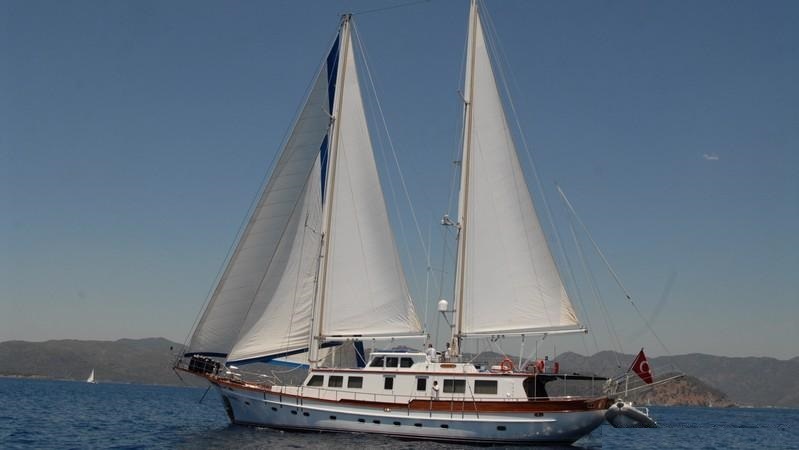 Sailing yacht RIGEL is a custom designed Gulet built in 1994 and refitted in 2005 and 2013. 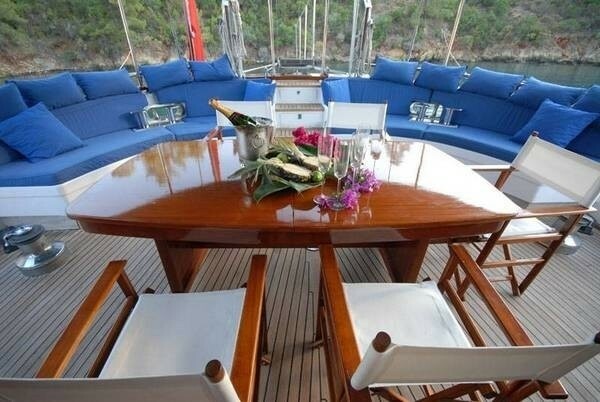 The yacht measures 30.5m (100ft) and offers spacious accommodation for up to 10 charter guests. 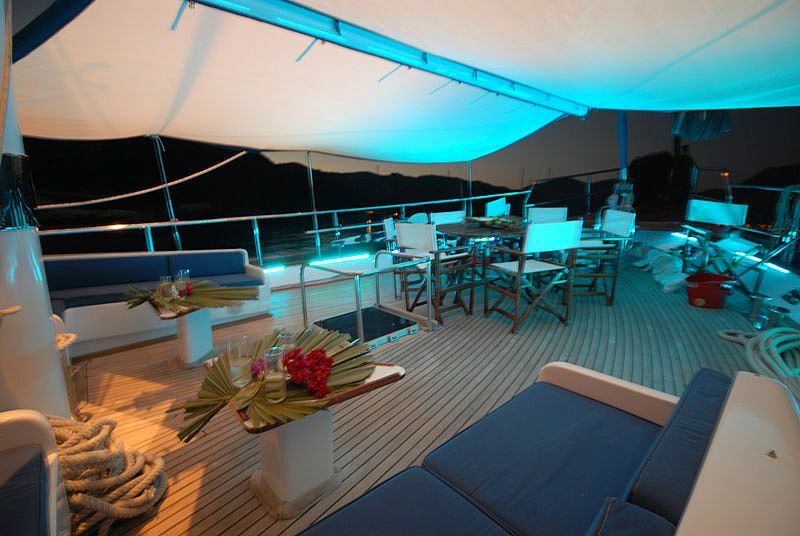 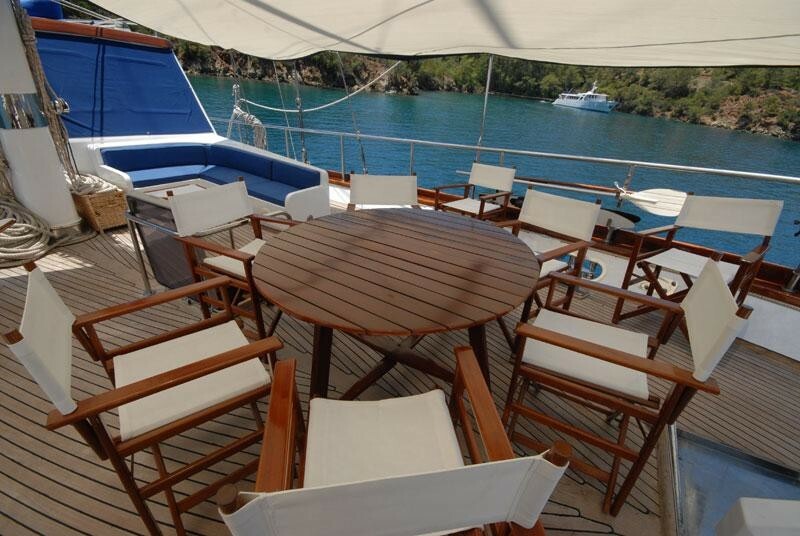 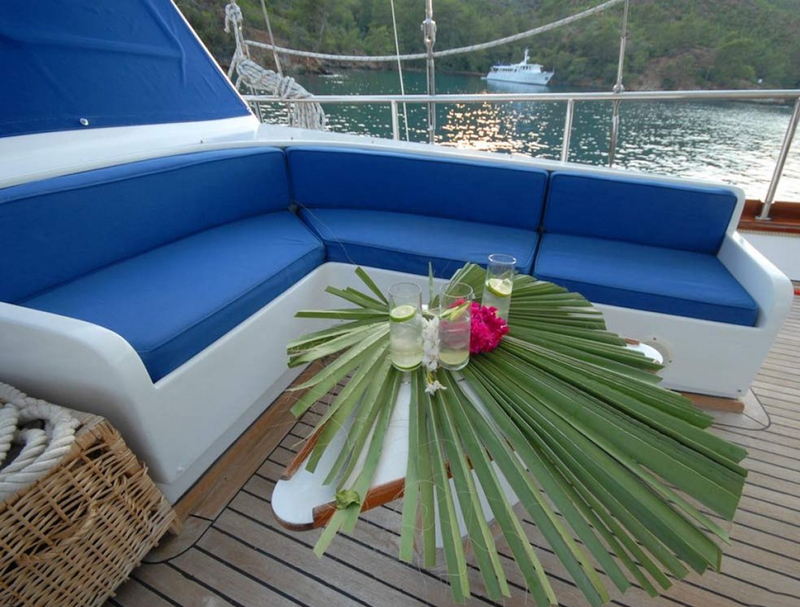 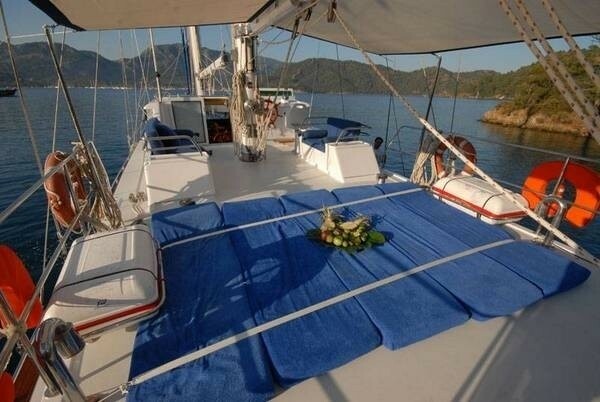 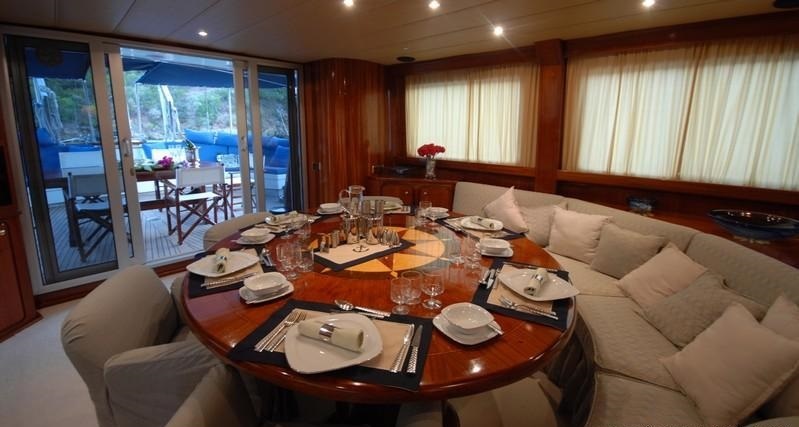 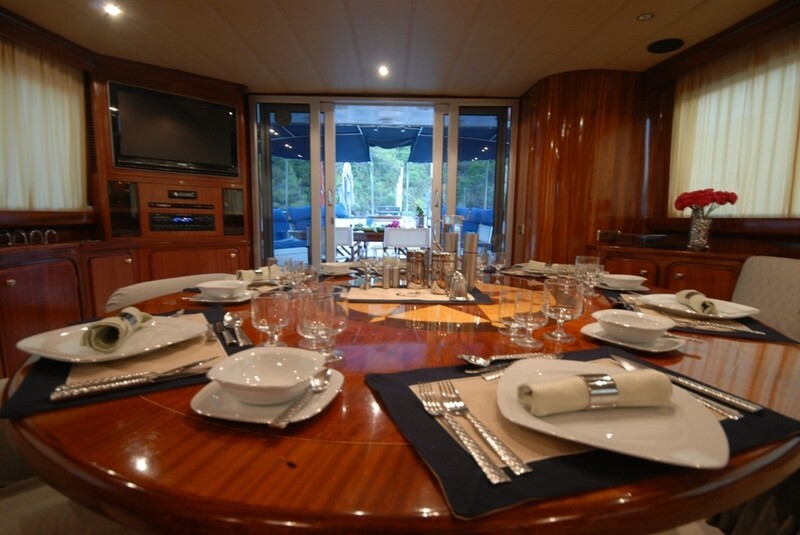 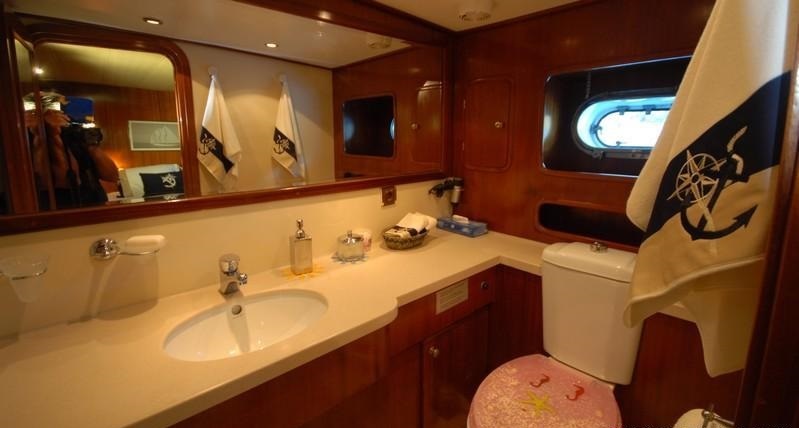 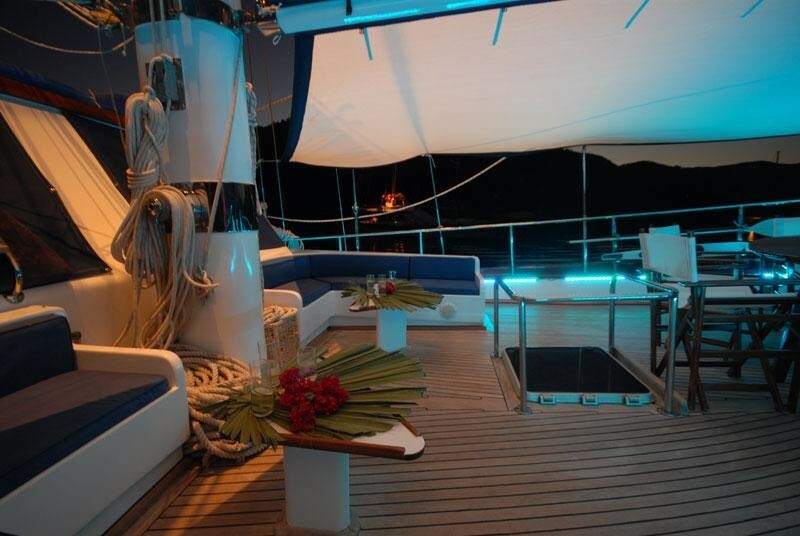 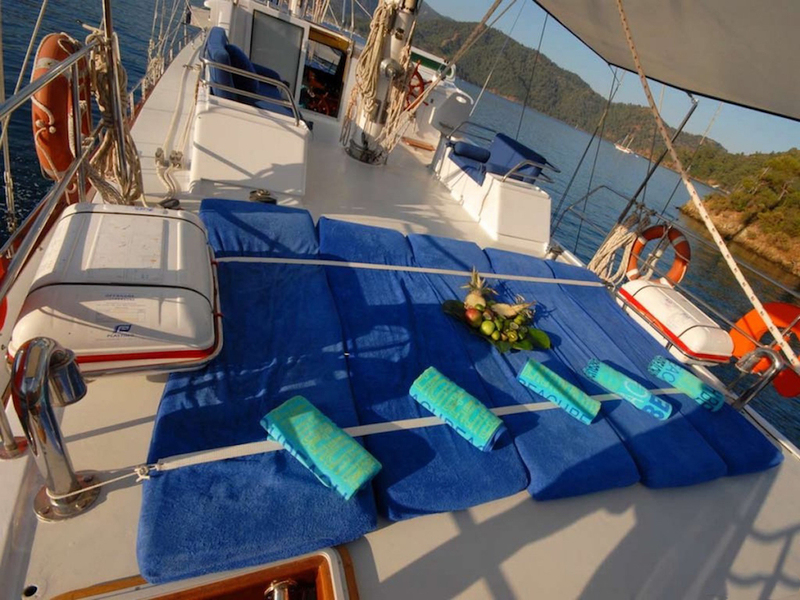 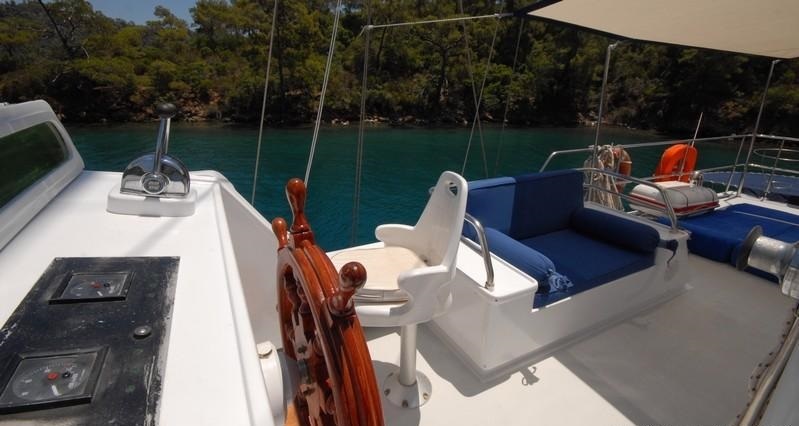 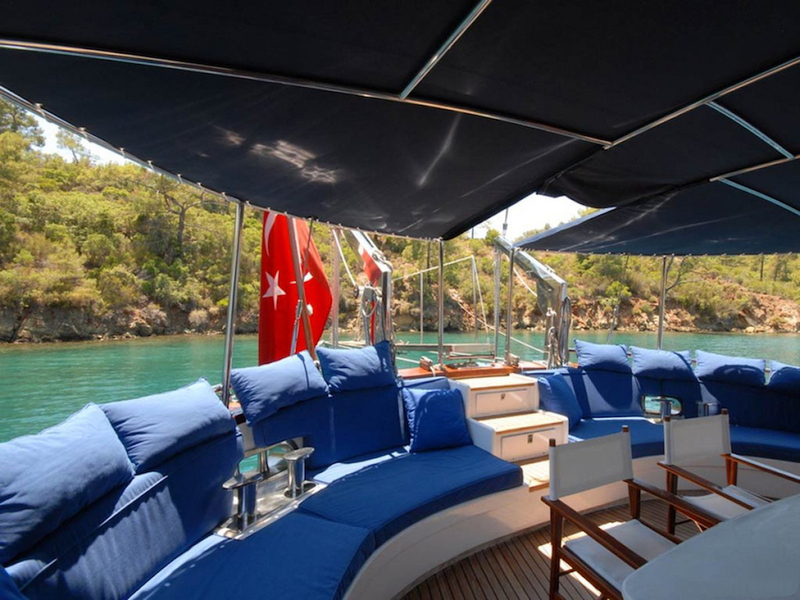 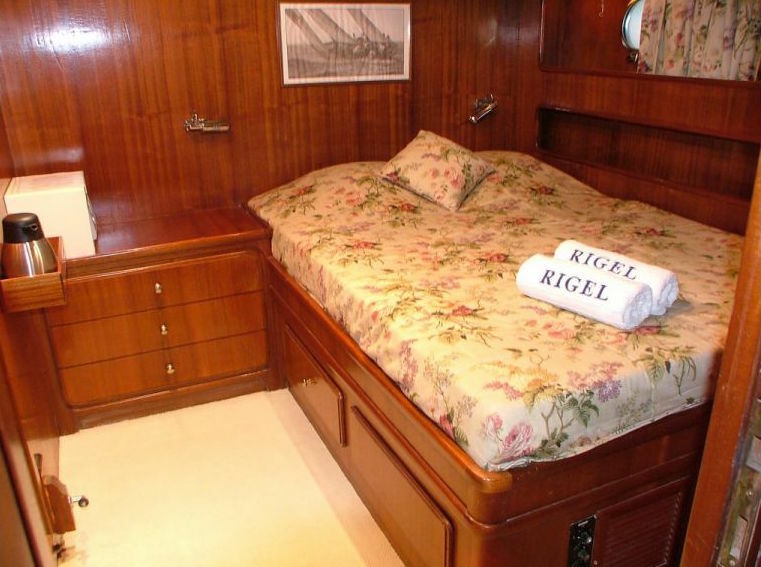 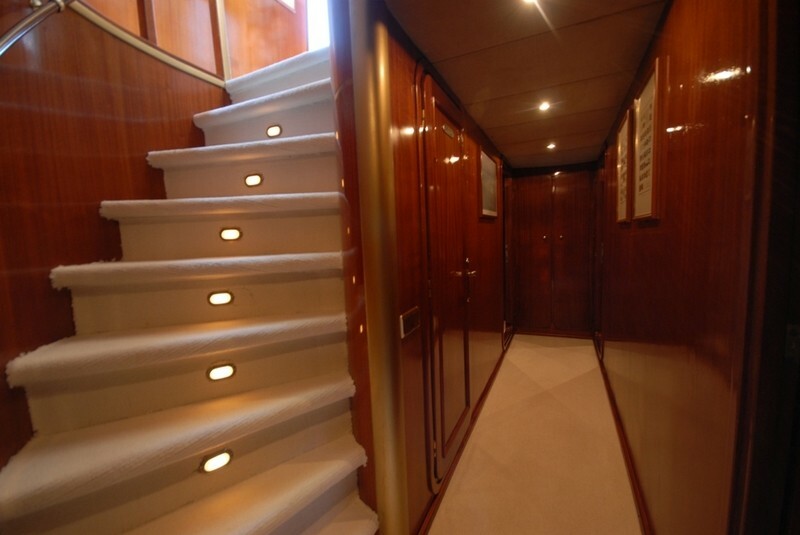 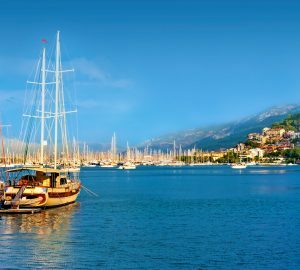 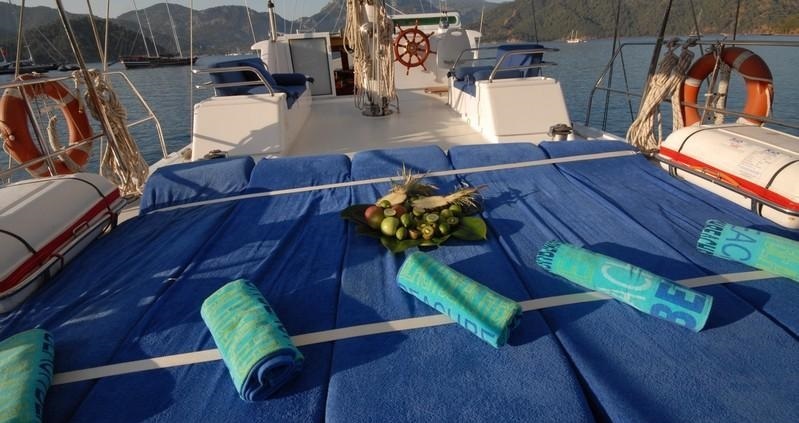 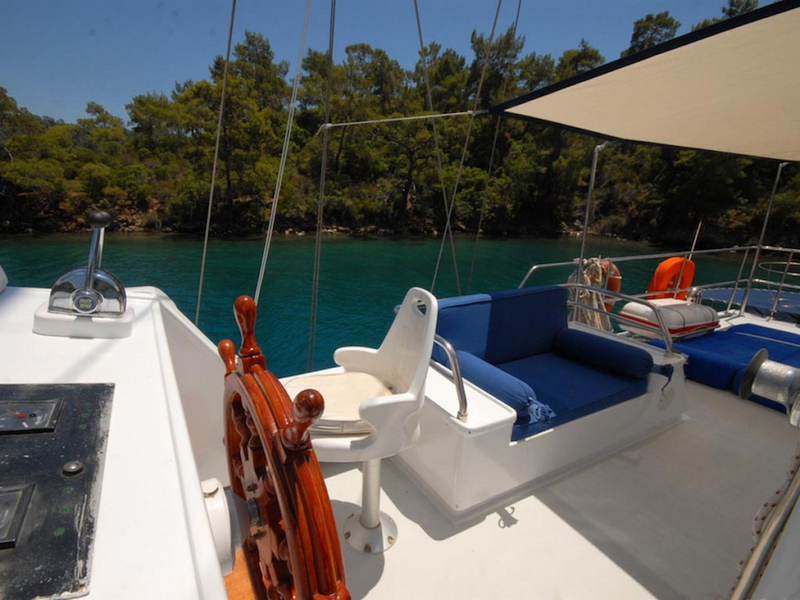 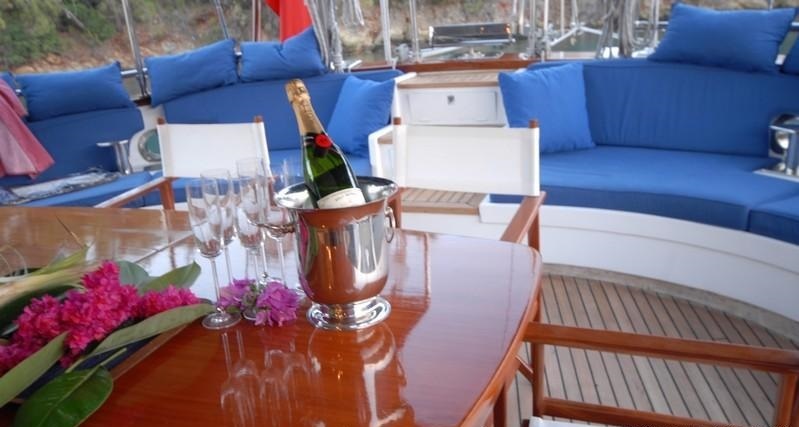 Crewed charter yacht RIGEL is fully air conditioned throughout and boasts ample interior space to relax. 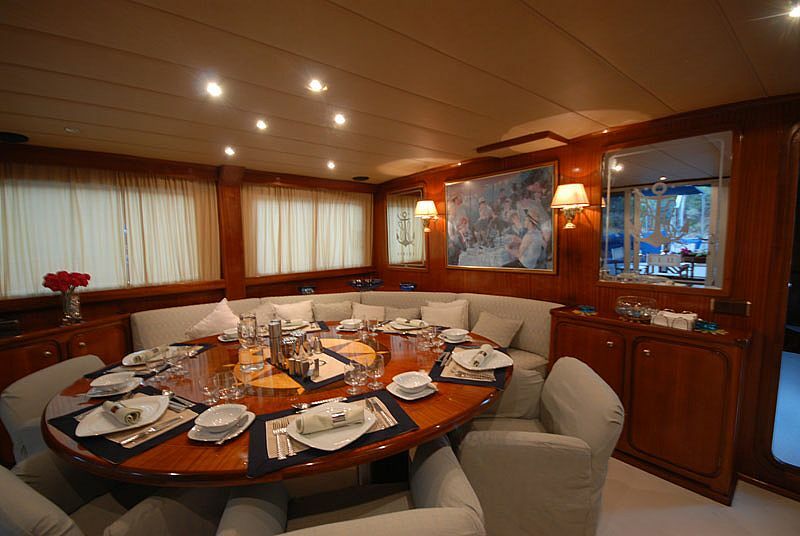 The salon and dining is a contemporary open plan, with a large crescent shaped sofa, occasional chairs, formal dining and full entertainment systems. 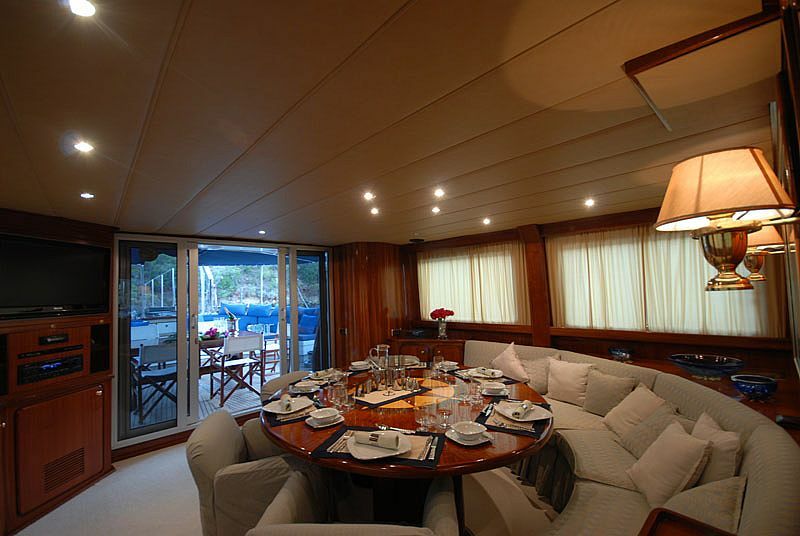 She receives plenty of natural light from surrounding panoramic windows and large sliding glass doors aft. 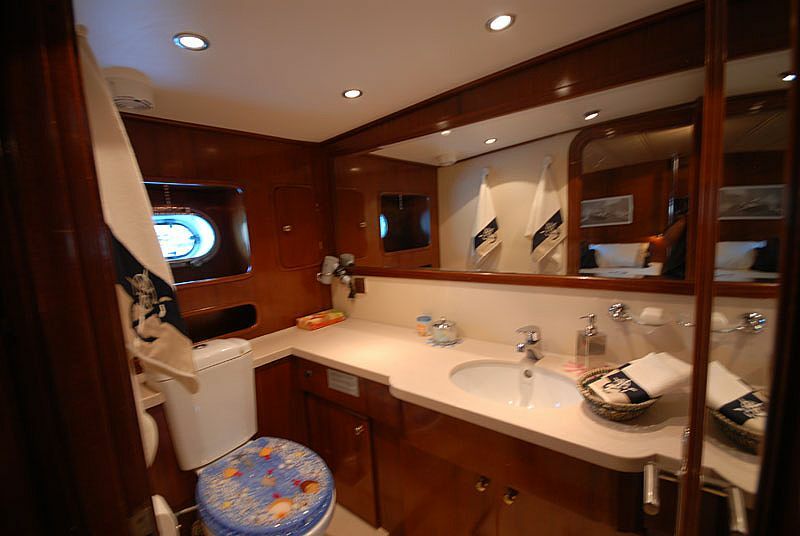 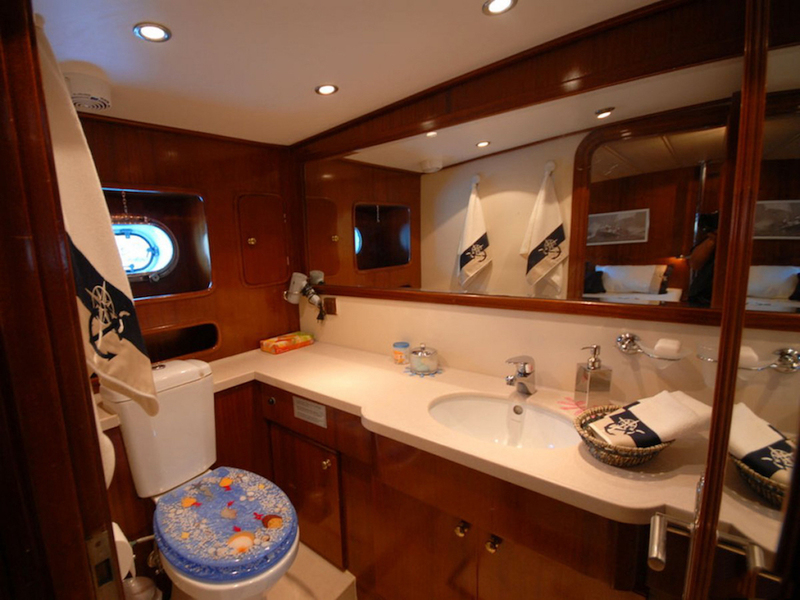 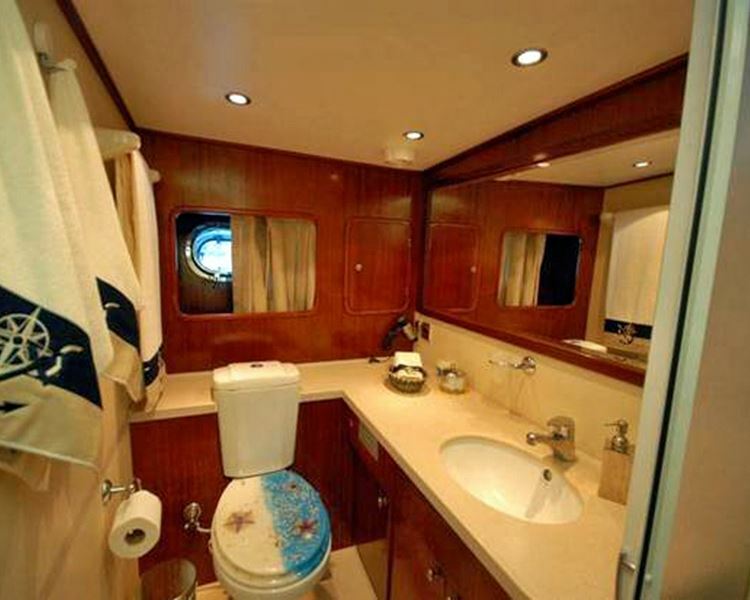 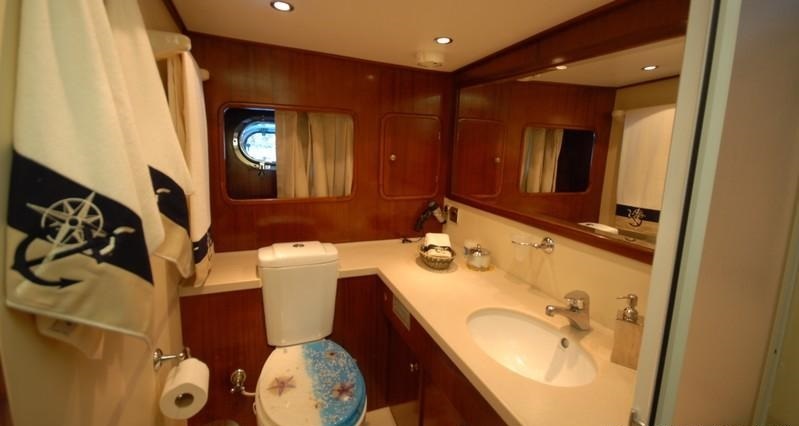 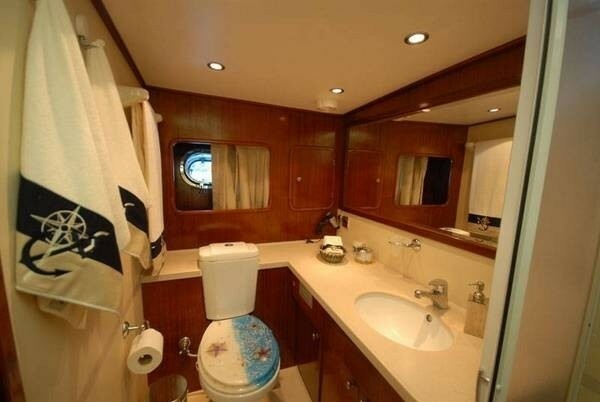 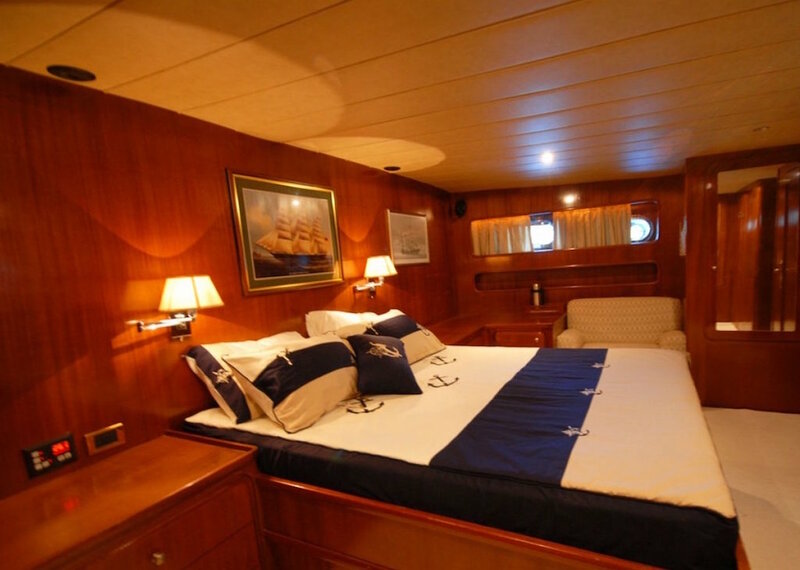 Guest accommodation is in 1 master cabin on the main deck forward and 4 double cabins below decks. 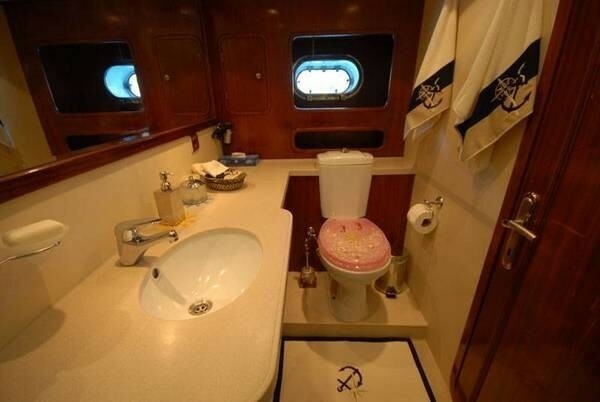 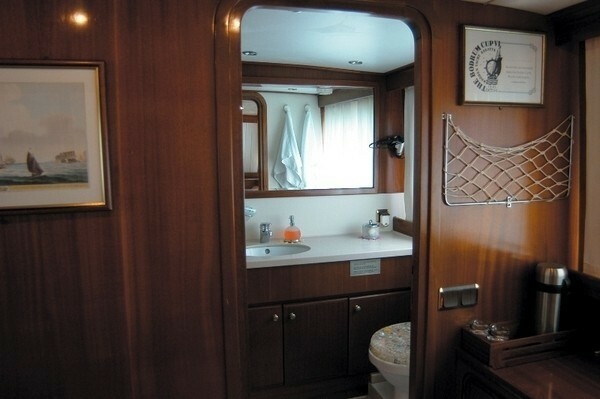 The crew has separate quarters, ensuring optimum guest privacy. 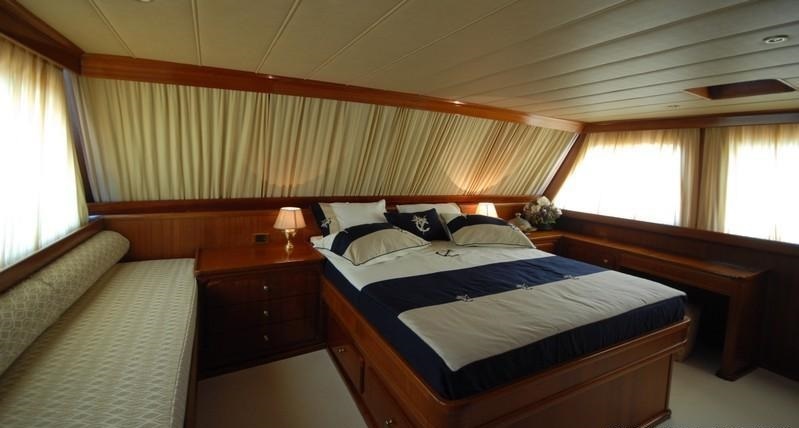 She features a wide 6.5m (21ft) beam, which allows for really spacious living spaces onboard. 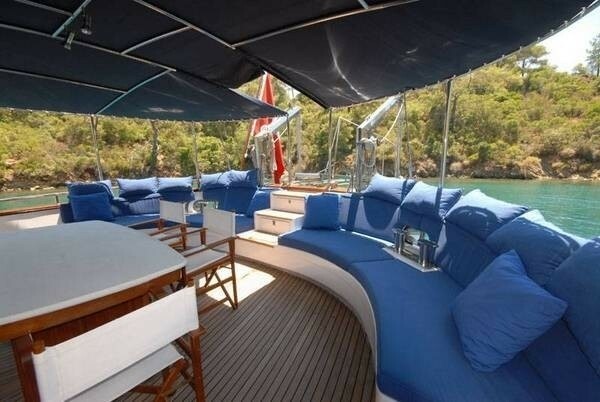 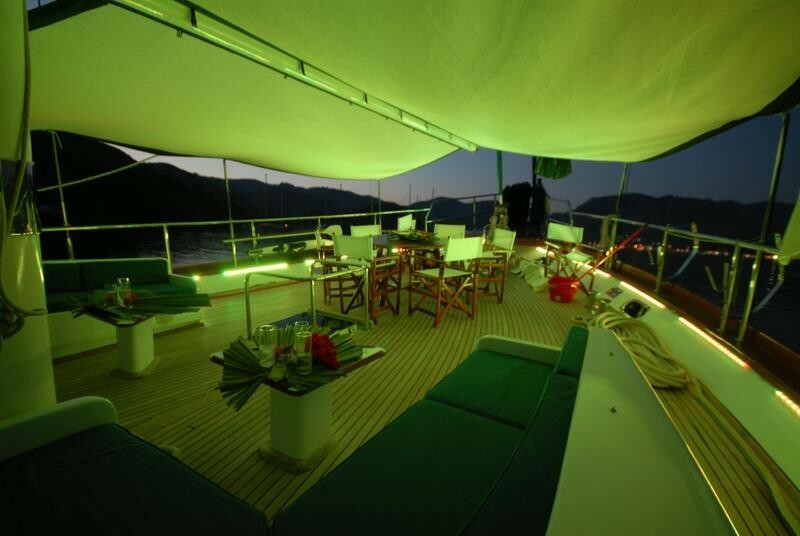 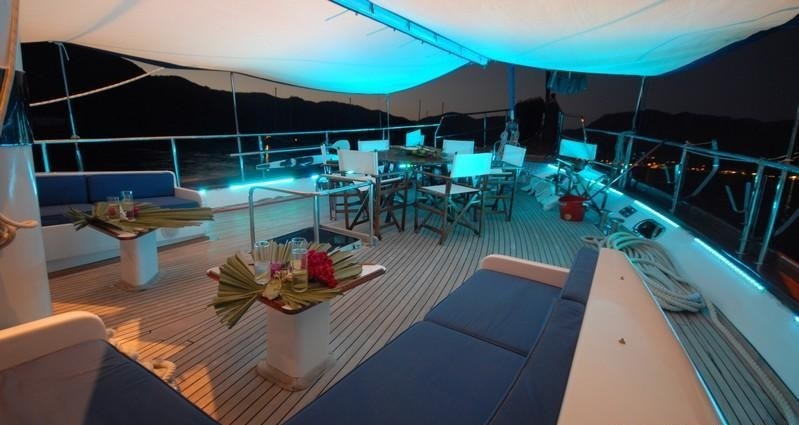 Aft of the salon is a shaded deck, offering wrap around seating and an alfresco dining option. 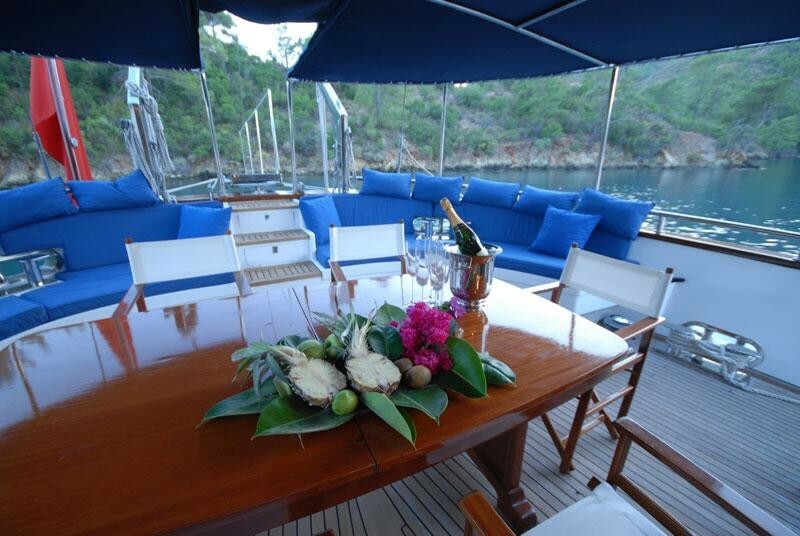 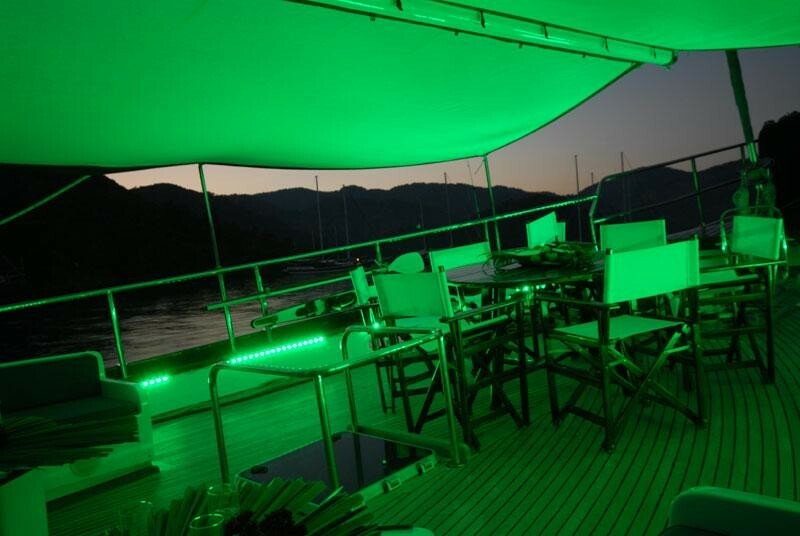 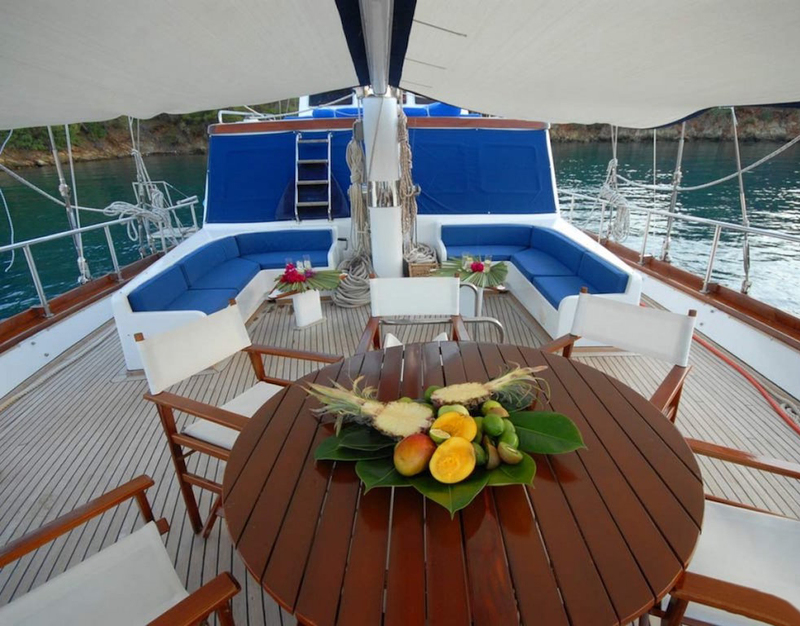 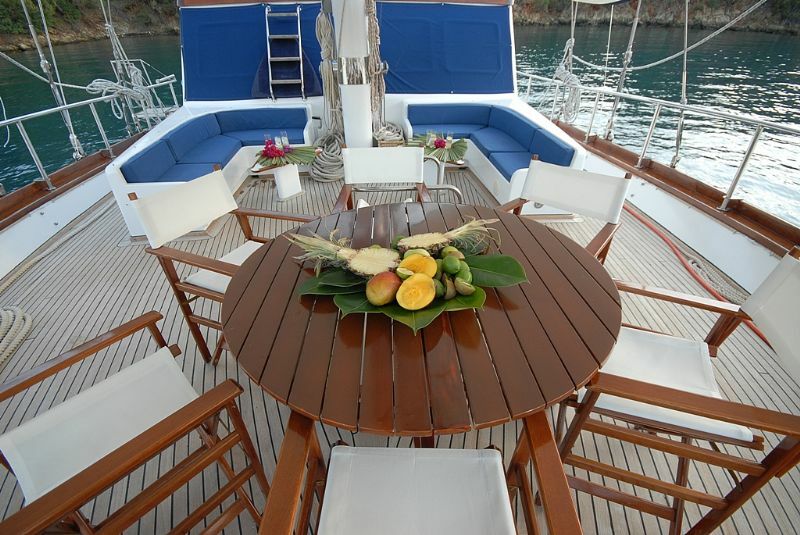 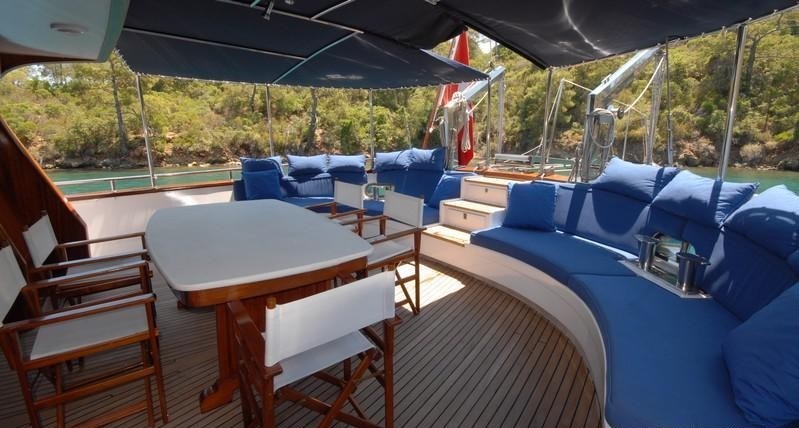 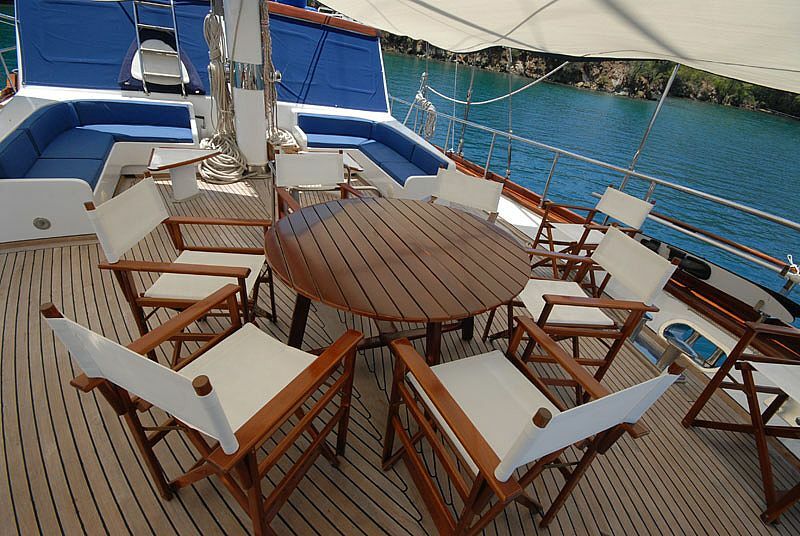 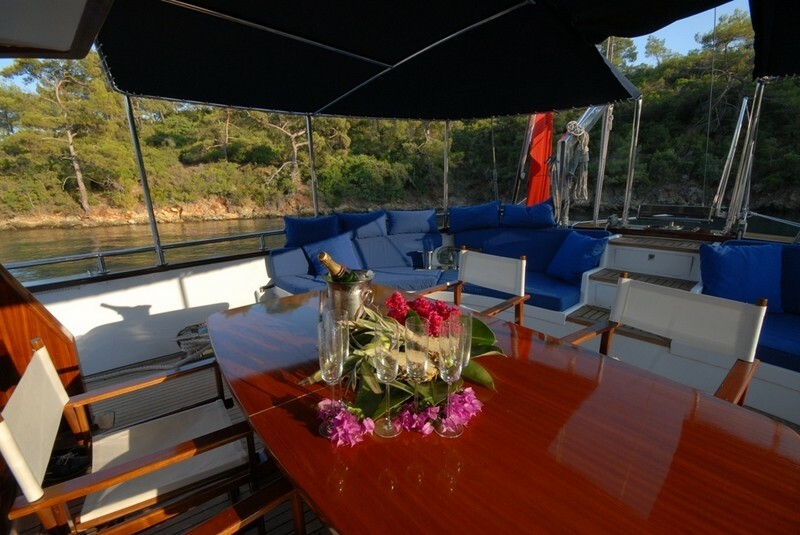 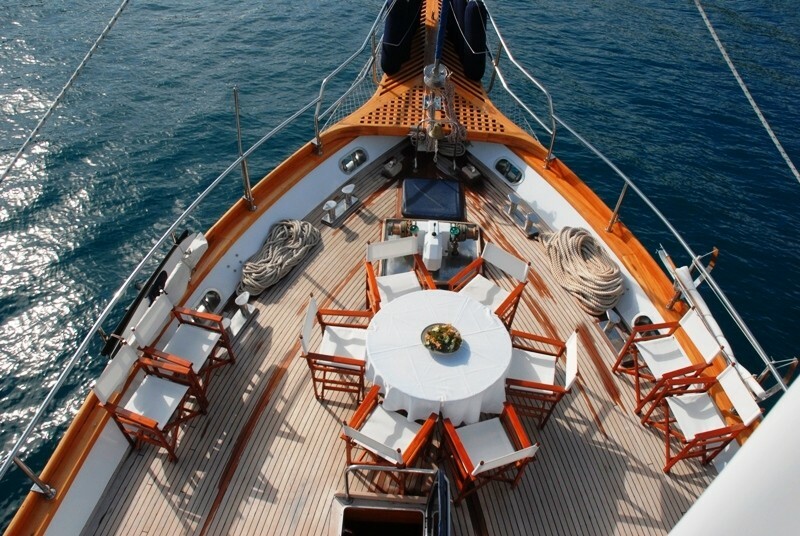 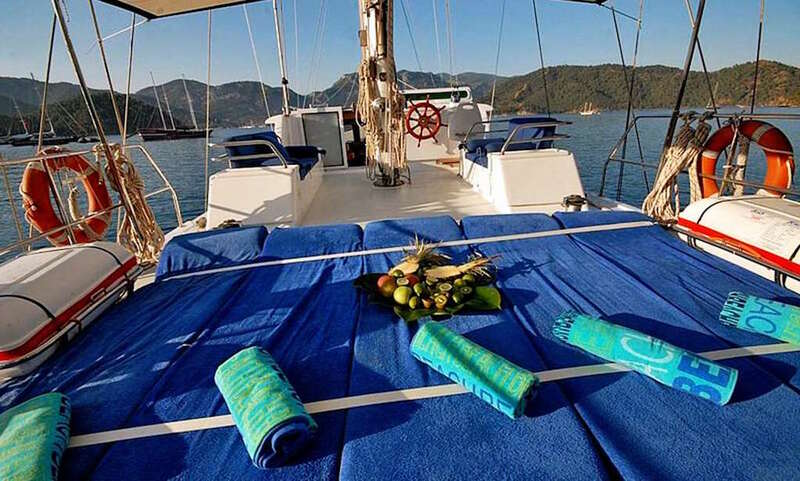 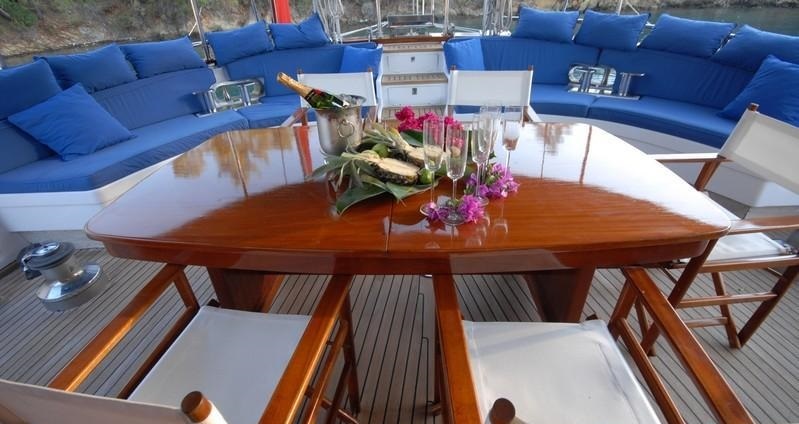 Guests can easily walk to port or starboard to the foredeck, where a further alfresco dining table and seating is, plus optional shade while at anchor. 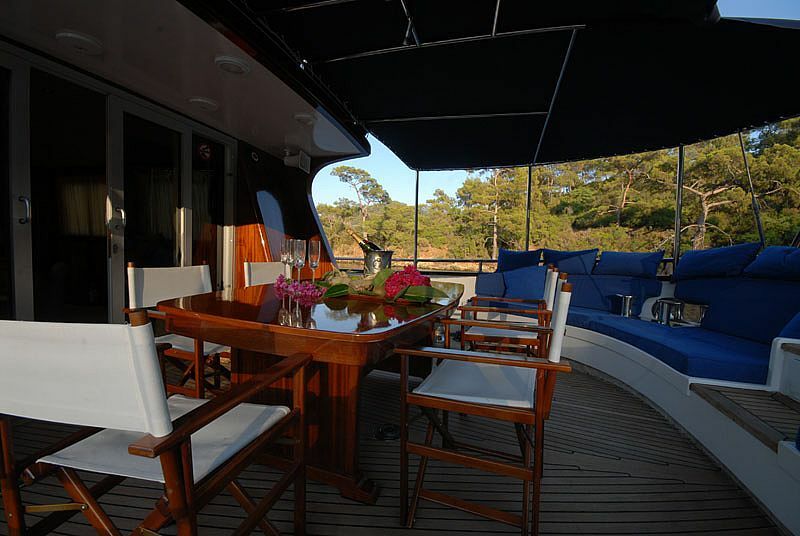 The cabin house forward offers sunpads, while an upper flybridge boasts additional sunpads, perfect for those who wish to soak up the rays, with no interruption. 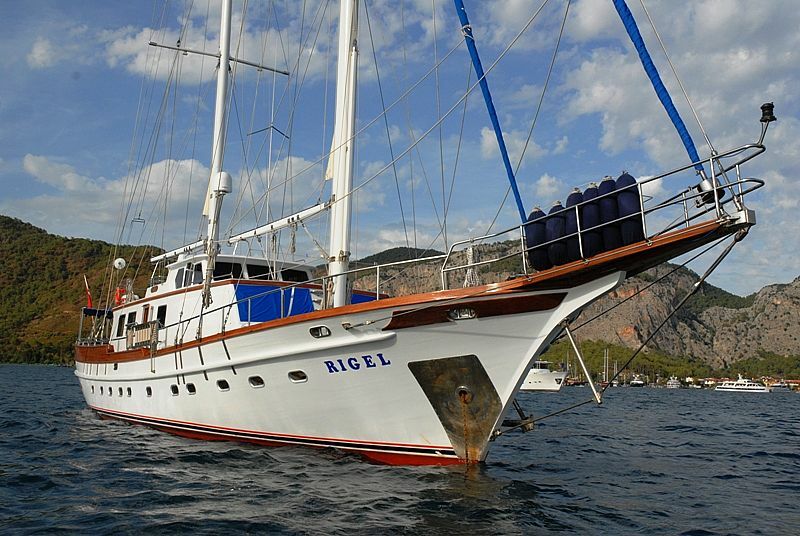 While not under sail, crewed charter yacht RIGEL is powered by 2 x MTU 193hp engines, capable of 9 – 11 knots. 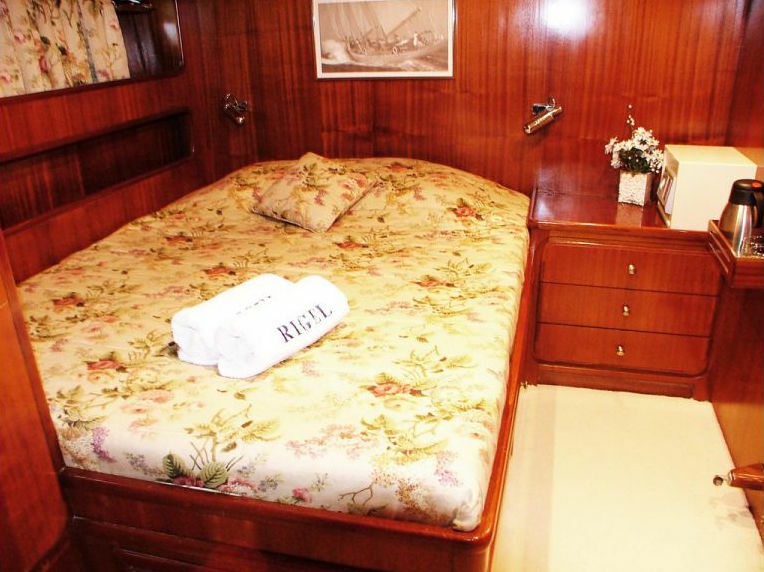 RIGEL offers stylish accommodation for up to 10 charter guests, in 5 double, en-suite cabins. 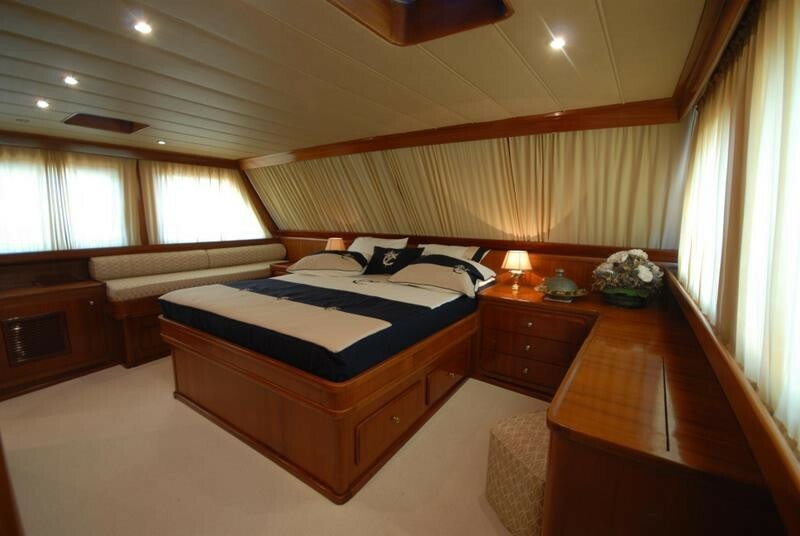 The master cabin is on the main deck, forward of the salon and full beam of the yacht, with 180° views, a king size bed and sofa. 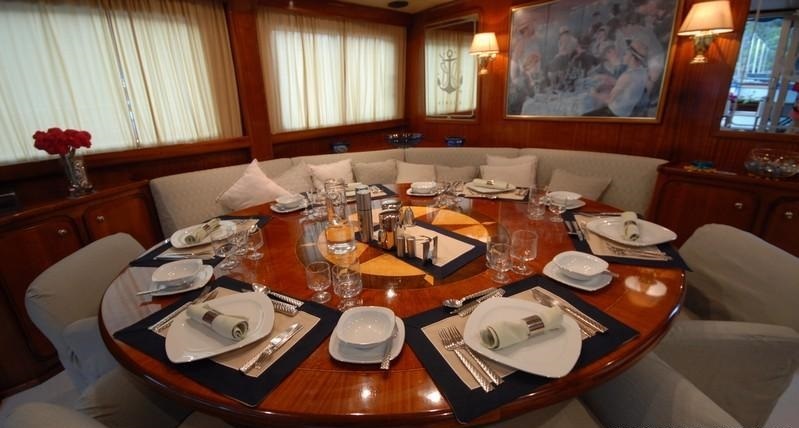 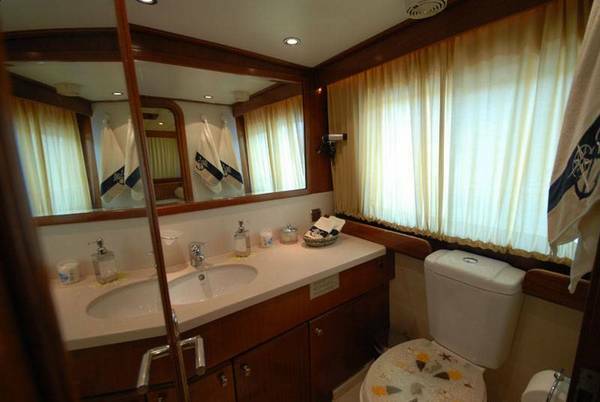 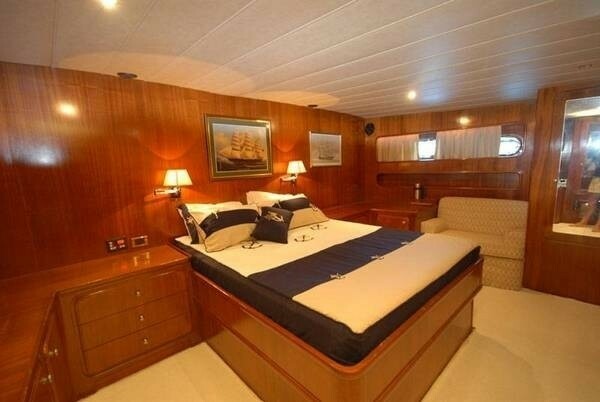 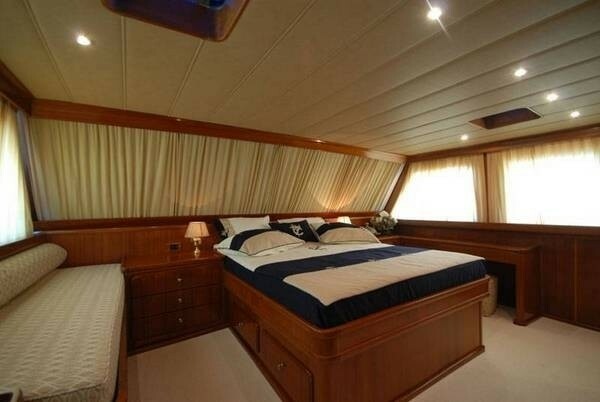 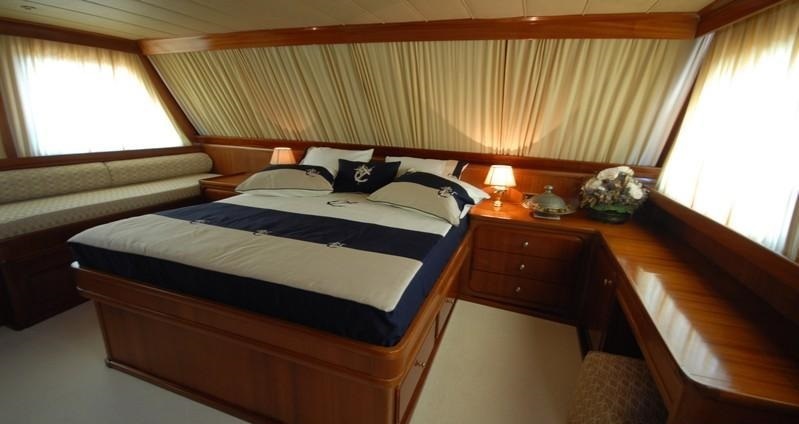 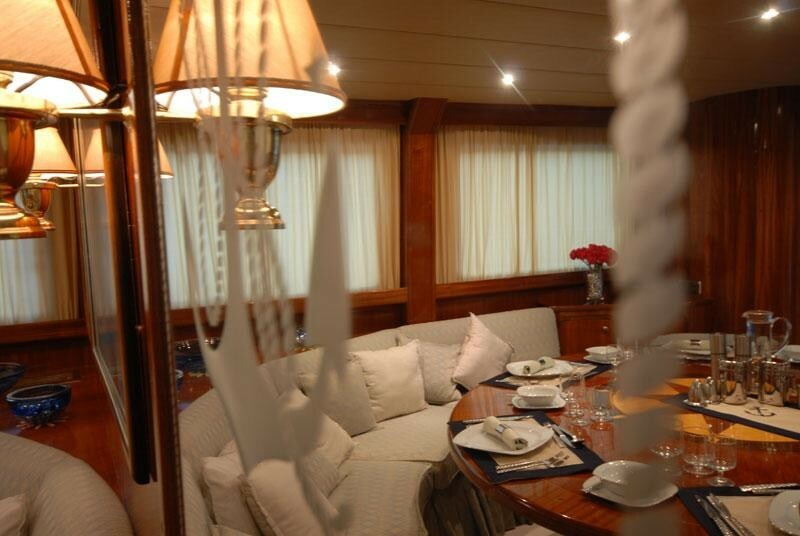 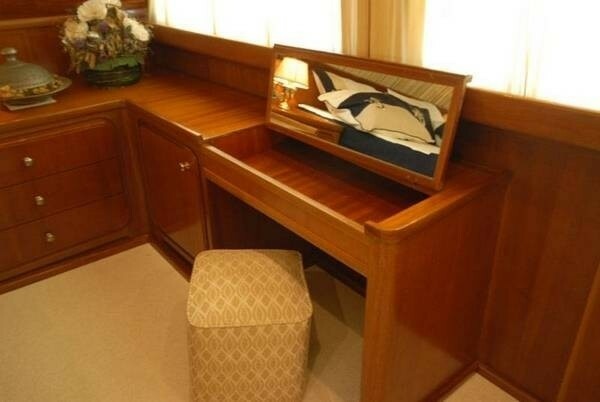 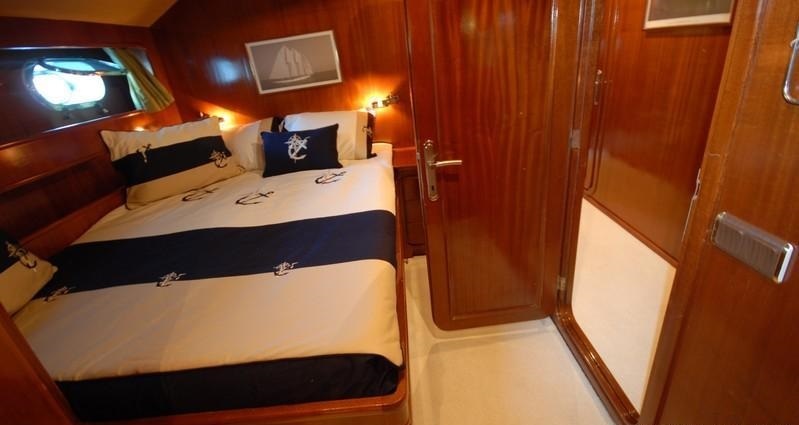 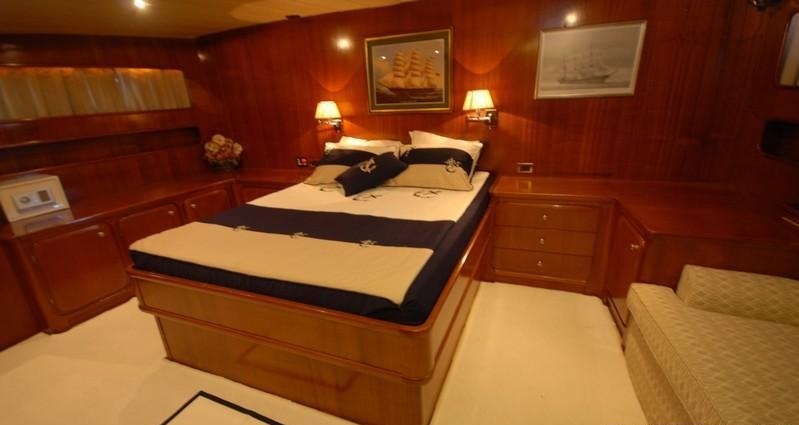 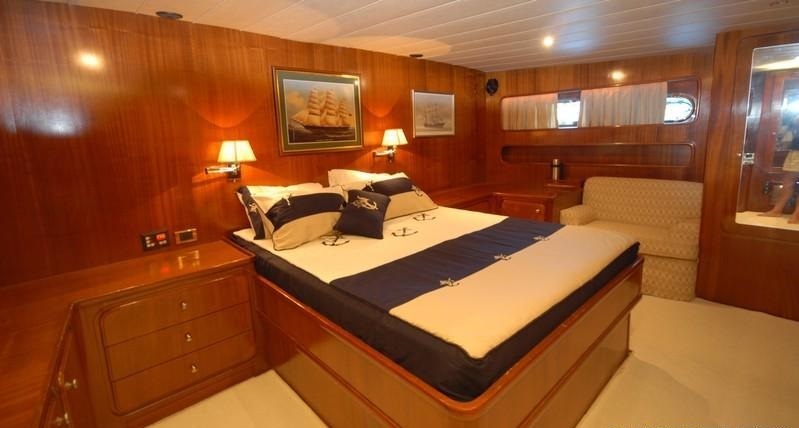 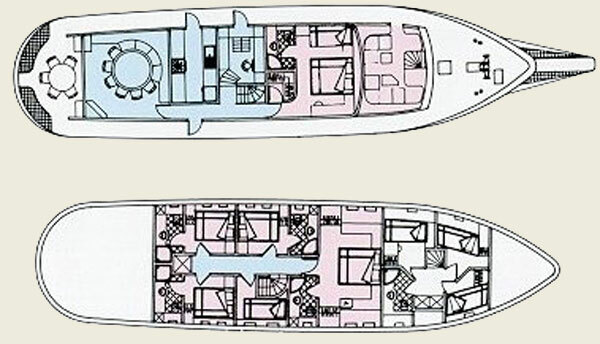 Below decks, the VIP cabin is full-beam of the yacht, with a king size bed and sofa. 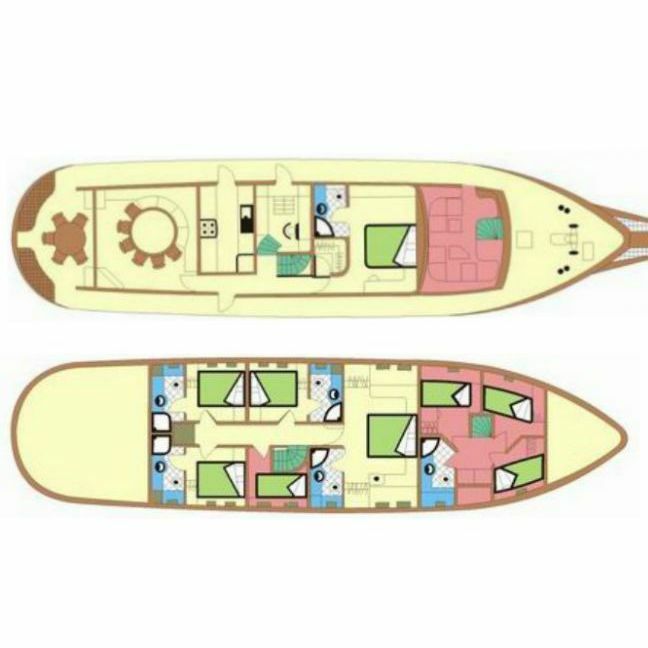 A further 3 cabins each offer double beds. 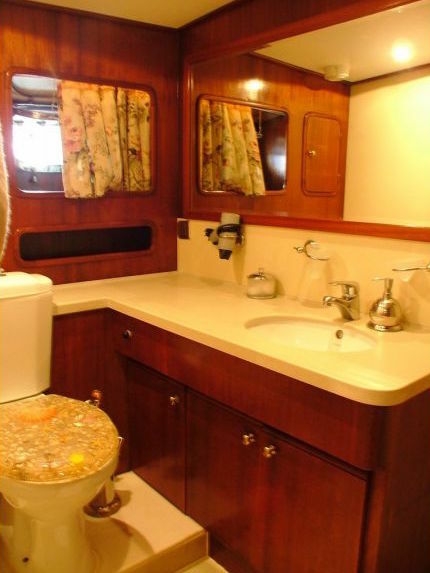 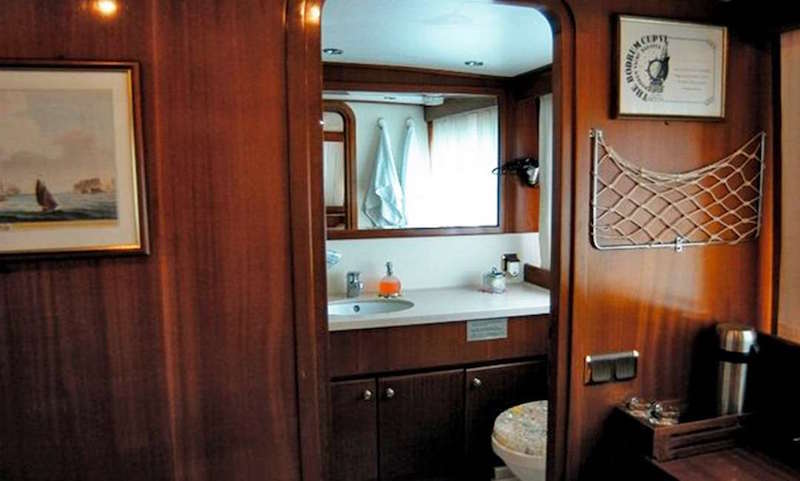 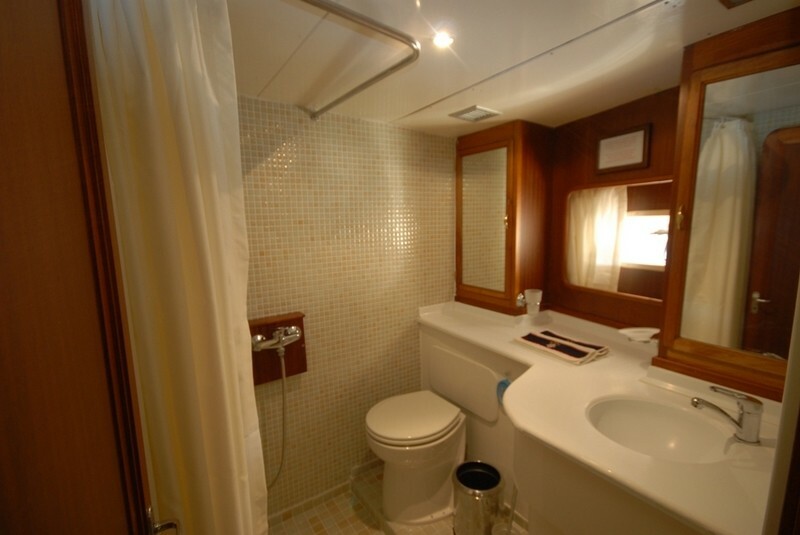 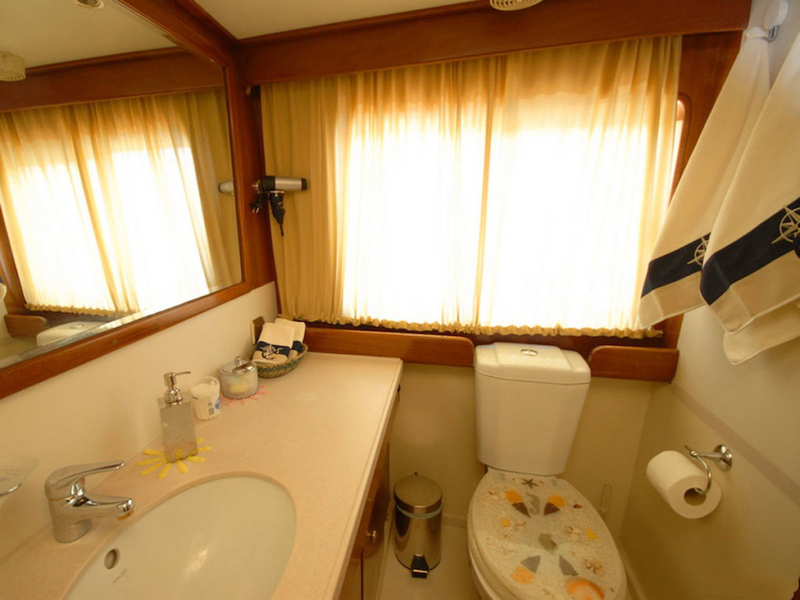 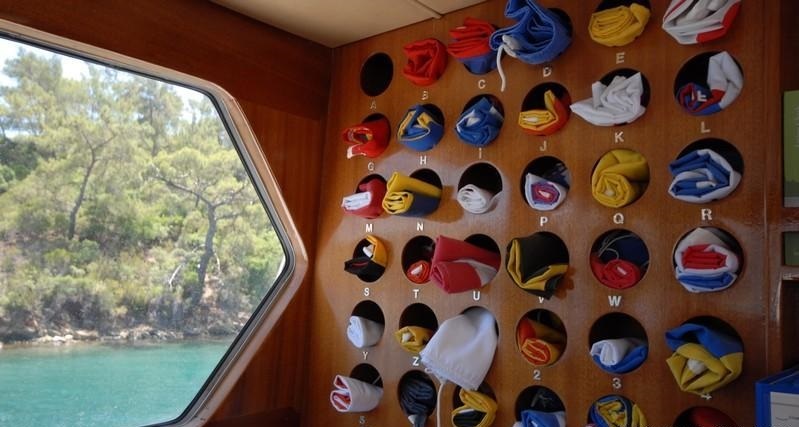 All cabins are finished with high gloss wood panels and neutral furnishings, emphasizing a relaxing nautical theme.